Jonathan Demme: [After Young did the title song “Philadelphia” for Demme’s film]. The next time Neil’s on the east coast, we go to the concert and it was amazing, and I met Neil for the first time after that and we kind of developed a little bit of a dialogue. I had seen his Greendale by then and it was great. So I called up and he said, “I’m just finishing up this album called Prairie Wind” and he told me he’d had an aneurysm and it could have been fatal and he’s written these introspective songs and he said, “Maybe we can do something with this new body of music?” He said, “I think it’s one of the better things I’ve done in a long time,” so I said, “Can I hear it?” He sent me the songs and they were great so we started talking on the phone. What happened through the conversations was the idea of let’s turn this into a kind of tribute to Nashville, which Neil loves so much and I love so much. So what it turned into was a love letter to the Grand Ole Opry-style of presenting music to an audience. I worked with a wonderful painter on making two fabulous backdrops and then we chose the Ryman Auditorium, which is the church in Nashville of country music. We filmed that on two nights and that was so exciting because no one in the audience... the record hadn’t come out yet, so we were actually debuting a new body of work by a major composer. You have trust that the audience is going to love these songs as much as you do. And they’re going to respond the way David Byrne pointed out that they need to respond in order to feed the people onstage. That’s it: no audience, as many cameras as you can afford, and once you put it together, just don’t cut. When we cut Heart of Gold, this was me being funny at the time, I go to the cutting room on the first day told [editor] Andy Keir, “Okay Andy, I’d like to see your first cut at about four this afternoon and ha ha ha.” I said, “Oh, no, I’m serious. Take the close-ups and just cut the close-ups together and then we’ll start watching this movie and decide when it’s worth going to something other than an amazing close-up of Neil Young singing his songs." And in this way we built our narrative. That’s the other thing. You’ve got to have those connective angles, where you get the gold of somebody doing what they’re doing -- shooting a look to somebody over here and we’ve got them both in the shot. That’s the magic. That’s really the phenomenal glue and that’s one of the reasons that Justin reached out because he saw that in Stop Making Sense and he loves his band so much. Also, in the interview, a nice nod to another film collaborator of neil Young's, photographer Adam CK Vollick. Jonathan Demme: And then there was also a cameraman, one of the greatest shooters of all time, a young guy, Canadian, named Adam CK Vollick, who I met from Neil Young when we did Neil Young Journeys. I’ve worked with Adam on a couple of different performance films since then because Adam has this extraordinary sense of where the music’s going next, and he loves to makes connections. 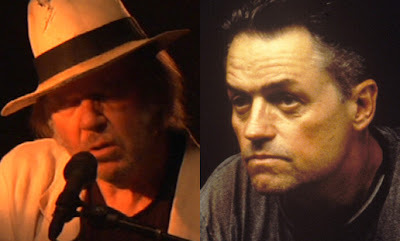 More on Jonathan Demme and Neil Young.